Artist Christo stands in front of his work The London Mastaba, on the Serpentine in Hyde Park, London, Britain, June 18, 2018. A 20-meter (22-yard) high sculpture of an ancient Egyptian tomb, made from 7,506 red, white and mauve barrels, has taken temporary residence amid the aquatic wildlife on a lake in London's Hyde Park. The floating installation — featuring two vertical sides, two slanted sides and a flat top — was unveiled on Monday by Bulgarian-born artist Christo. 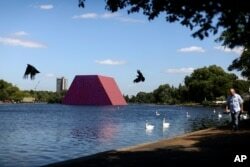 "For three months, The London Mastaba will be a part of Hyde Park's environment in the center of London," he said. "The colors will transform with the changes in the light and its reflection on the Serpentine Lake will be like an abstract painting." People walk past 'The London Mastaba' by artist Christo as it sits on the Serpentine in Hyde Park, London, Britain, June 18, 2018. Work started in April to stack the 55-gallon barrels into their cut-off pyramid shape on a floating platform 40 meters long and 30 meters wide. Thirty-two anchors hold the structure in place. Christo, whose full name is Christo Javacheff, was joined at the launch by former New York mayor Michael Bloomberg, chairman of the Serpentine Galleries. Christo and his wife Jeanne-Claude, who died in 2009, are known for such works as "The Gates," a 2005 installation in New York's Central Park, and the wrapping of the Reichstag in Berlin in 1995.